Rojak is one of the unique cuisine of Malaysia. The word rojak is of Malay origin, which means, cham-cham, that is the mixture of things. Who would ever know that mixture of this and that from each culture would form such a medley wonderful tastes that excites the palate. There are two distinct rojak here in Malaysia, one is the Chinese version which is we called the rojak buah (fruit rojak), which do have other stuff besides fruits such as vegetables, tofu and keropok. These are then mix in a dressing, made up of belachan (shrimp paste), sugar, chilli, lime juice, dark sauce, prawn paste, black bean paste and so forth, with each rojak comes in its own variation and then top with chopped peanuts and bunga kantan (torch ginger). As for the Indian rojak, which is commonly known as pasembor here are mainly consists of fried dough fritters, hard boiled egg, prawn fritters, fried tofu and cucumbers all mixed in dressing of spicy peanut sauce, usually comes in stall that also serves cendol; one day I will talk more about this. I had discussed with J whether the idea of rojak is originated from the Chinese or the Indian culture. But for sure, it is truly a unique Malaysia cuisine. Come to think of it, rojak is actually a mixture of the three main cultures in Malaysia, since the use of belachan, which is a Malay paste and of course, the name itself is a Malay word. One of the best fruit rojak I have tasted in town is this rojak stall in my new neighbourhood, which parks right opposite KFC. This is just a coincidence that it is in my neighbourhood, as I have long been hooked to it way before I shifted here. My cousin is the one who first brought it for me one day, when I was craving for some rojak, and I was hooked. Thus, fate must have somehow got me to stay here, and so one day (a recent one) on the way home, I took diversion there to get a pack for tea time snack. I ordered the usual Rojak Special, without the sotong (squid). I spied a newspaper cutting of a review of the stall, pasted there, which titles something like “the tastiest rojak in town”, I could not agree more. Since it’s so yummy, naturally you have to wait a little as there would be people all around. So I took the time to take some pictures of the stall and then the owner (the guy on the left with the apron) caught me in the act. “Uncle, you play internet too?” I was shocked. “Oh yea, you can post it up for free and then whoever reads it, uh – reads it.” Mentally whacking myself for not being able to describe blogging properly in Chinese. “Oh, I must do too, as promotion for this stall” He smiled. 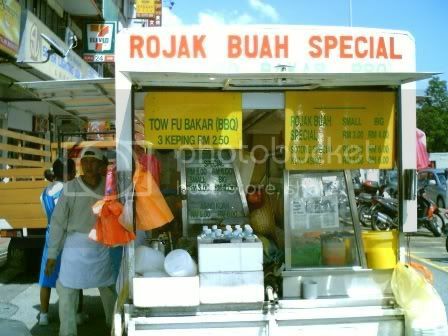 The thought of a blog, dedicated to promote a rojak stall cross my mind in a flash. “Sure you can, uncle” I said, flashing a big grin at him. Out of sudden, the wife who has been quiet all along, agrees with this, open the drawer and whips out a pen and a paper. Still in a faze, I wrote down my address, keeping in mind I better write this review quick, or they will be viewing with disappointment. 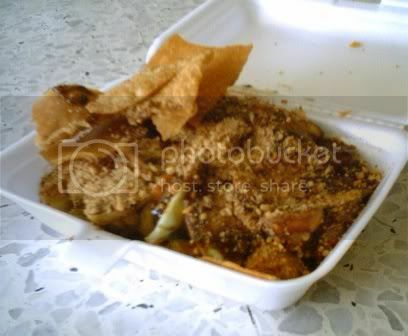 Then finally I got my pack of rojak, which the wife prepares all the while when I am chatting with the husband, and bid goodbye. I left with a smile on my face and their faces too, from the lovely conversation and also of course, the thought of able to devour my favourite rojak when I got home. I open the pack of rojak and boy was it yummy looking. 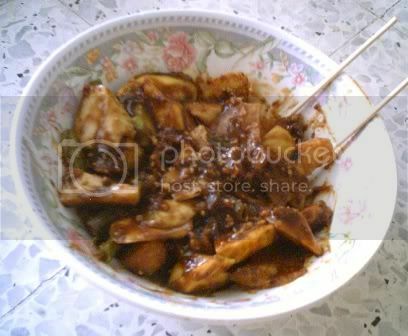 This rojak is consists of fruits, such as pineapple, guava, and many more that I forgot. Then there are the veggies, such as cucumber, sengkuang (jicama) and kangkung (water convolvulus). There are also tofu slices and the usual Indian keropok found in most rojak. The specialty that sets this rojak aside from the rest is the addition of fried youtiao (dough fritters) which is fried to the crisp (in oppose to the usual softer chewy ones), and the dried squid which gives a whole new dimension of taste to the rojak. But overall, as usual, the tastiness of one rojak lies heavily on the sauce itself, and this sauce, is absolutely yummy, enough belachan spiciness and the right sweetness. The sauce is coated all around the medley of fruits, veggies, tofu and keropok and then generously topped with chopped peanuts. Oh, yummy! It is hard to describe how a rojak taste like, until one taste it themselves, so go try it, if you are one of the lucky people who are in Malaysia, best yet in town to try out this stall. comments are complete but where is the address, specific location ?